Harlow (d. 1819) painted two portraits of Northcote, exhibited RA in two consecutive years, 1816 and 1817. The first was commissioned by Sir John Swinburne, Bart, engraved by F. C. Lewis in 1824 and shows him in benevolent mood, slightly smiling, looking upwards, with his Memoirs of Reynolds (published 1813) to left, and in the background partly concealed by a curtain his large painting 'The Burial of the Princes in the Tower' finished in 1820 but no doubt in the studio in 1816. Swinburne lent it to the British Institution exhibition 1843 (123); it was then acquired by W. P. Frith RA who lent it to 'Old Masters' RA 1879 (30), then by W. Hennell who allowed its reproduction as frontispiece to Gwynn's Memorials, 1898. 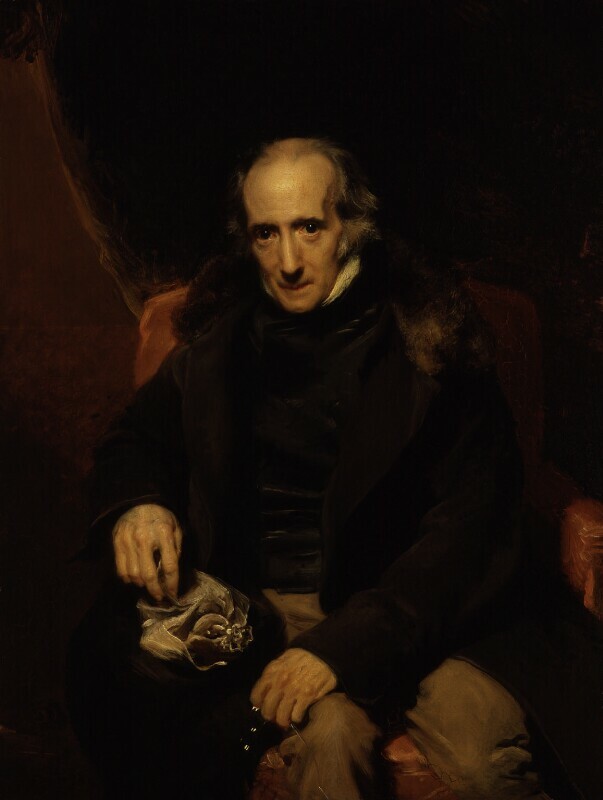 The NPG portrait shows him looking more aged, less benevolent, his eyes cast downwards; it belonged to Lady Exeter as shown in Worthington's print and probably hung at Burghley House. The donor, John Carrick Moore, says in a letter to Scharf: 'I, who was born when Pitt was Minister, knew old Northcote well, and can answer for its being a striking likeness. What induced Lady Exeter to purchase it we cannot guess. I can remember when a young man hearing her speak highly of Nollekens of whom she had a bust; that is all that I know of her connexion with modern art' (letter 26 October 1894 in NPG archive). Lady Exeter also owned a Northcote self-portrait, a head painted in 1823 (Northcote MS Register and Stephen Gwynn, Memorials of an Eighteenth Century Painter, 1898). A copy of NPG 969 was sold at Christie's 25 May 1973 (282). Three-quarter-length seated facing holding painting rag in right hand, spectacles in left, dark grey coat with fur collar, black waistcoat, buff trousers; sparse grey hair, piercing dark brown eyes, sallow complexion, serious expression; dark brown curtain background. Lady Exeter before 1829, probably given by her to John Carrick Moore and given by him to the NPG 1894. RA, 1817 (356); 'Faces in Art', NPG, 1976. Mezzotint by Wivell 1819 (example in British Museum) and stipple by Worthington 'From an Original Painting by Harlow in the Possession of the DOWAGER MARCHIONESS OF EXETER' published Lawford as frontispiece to Northcote's One Hundred Fables, 1829.